Members of San Francisco Young Democrats watching the Democratic National Convention in the city on Thursday night were moved by the historic relevance of the event and perhaps persuaded to believe the party can unite behind the first woman to accept a major party's nomination for president. 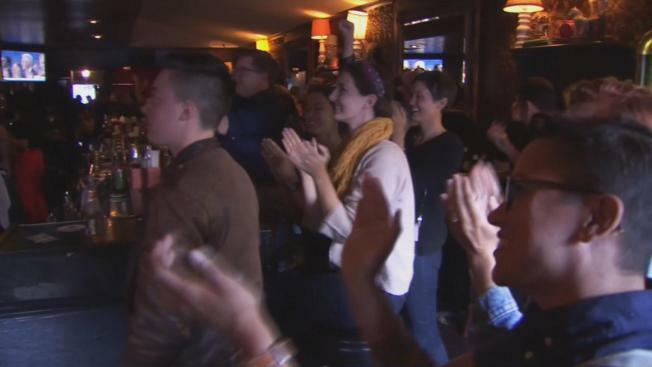 As Hillary Clinton gave her rousing acceptance speech in Philadelphia, supporters of both Clinton and Bernie Sanders packed Virgils Sea Room on Mission Street in San Francisco to take in the landmark moment. For some, it was emotional. "She's an imperfect candidate, but her beliefs are the same as mine," said Jennifer Lucas of San Francisco. Clinton told Sanders supporters she's on board. "Your cause is our cause," she said in her speech. And she may have even won over some Bernie backers. "We couldn't beleive what we were hearing; a laundry list of everything we wanted to know," said Maura Dilly. "I feel like I trust her," said Carson Christiano. "She is super intelligent. Her expertise is obvious to me. She should take the reins." Indeed, many at Virgils felt Clinton presented a compelling case. But they know there is still work to do. "I'm gonna drive to Nevada and canvas for Hillary in the fall," said Ian Blue of SF Young Democrats.